Blogs / By Joey Bargo, M.D. 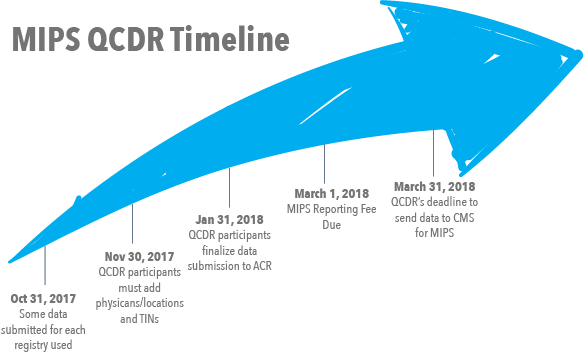 Step 2: If you are interested in using the ACR QCDR through Thynk Health, but are NOT currently submitting data to NRDR, register for the National Radiology Data Registry to start that process now. Past QCDR participants do not need to re-register with NRDR and may use their existing account(s). This should be completed by October 31, 2017. Step 3: Thynk Health will retrospectively track the 2017 quality measures using advanced NLP technology, and via connection to the ACR QCDR will submit physician and/or group practice quality measures and improvement activities to CMS on your behalf. By January 31, 2018, physician and group practices must complete submission of quality measure data and improvement activities to the QCDR. Step 4: Several activities will still be performed through the MIPS portal. Between January 31 and February 28, physicians and group practices must review 2017 performance rates on QCDR supported measures, and submit updated data if needed. Between January 31 and February 28, physicians and group practices must select measures to be submitted and provide information on total relevant exams performed for those measures. NOTE: For GPROs the facility admin can select measures, provide exam counts and attest to final measures. By February 28, 2018, physicians and facility administrators for group practices must confirm final measure selections, and authorize ACR to submit measures to CMS. Measures and improvement activities must be selected for CMS submission at this time. NOTE: A facility administrator email is required for GPRO attestation and data submission to CMS. By March 1, 2018, total payment is due for the MIPS. Payment may be made by credit card or check. 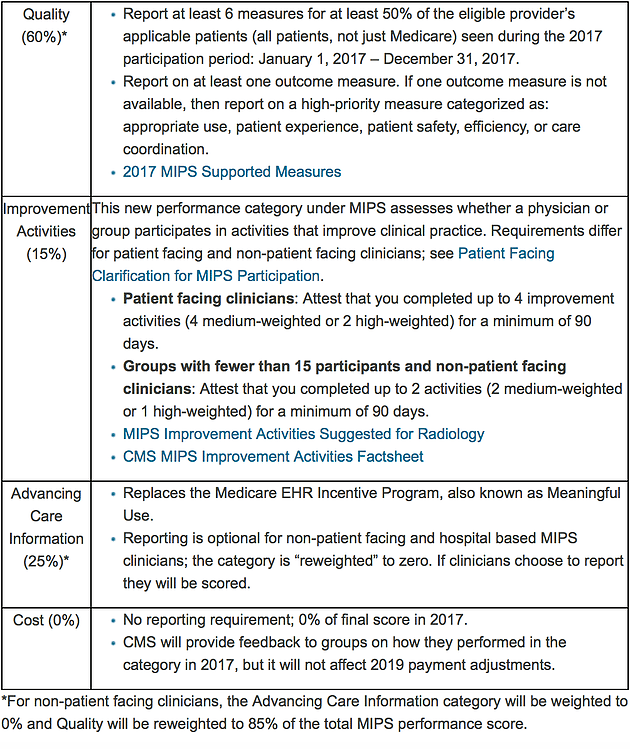 Step 5: By March 16, 2018, physician and group practices must attest the accuracy of data submitted for the 2017 MIPS reporting year this is handled in the MIPS portal. No measures or activities will be sent to CMS without attestation complete. Attest that Thynk Health is helping you use available data regularly to analyze opportunities to reduce cost through improved care. Thynk Health will show several cost saving opportunities to patients through follow-up guideline evaluation. Dr. Bargo has spent the last decade focused on the intersection of radiology, technology and reporting. His involvement with Thynk Health has helped to provide invaluable insight into product development and clinical informatics concepts that are have made the platform an industry leader.